Leaving Istanbul’s Çağlayan courthouse on Friday and offering comment to assembled journalists there, Dündar narrowly escaped being shot and killed by a man later identified as Murat Şahin. Dündar, his attorneys, and others involved in the case were loitering outside the courthouse during a break in proceedings. Dündar’s wife confirmed that the shooter approached the editor and called him a “traitor” before shooting and being immediately apprehended. A journalist on the scene identified as Yağız Şenkal of NTV was wounded in the leg, according to the newspaper Hurriyet. Videos have surfaced showing different angles of the incident – one, a live report interrupted by the ensuing scuffle behind the reporter, and the other a video of Şahin surrendering to police in front of Dündar. Both editors were sentenced to five years in prison shortly after the assassination attempt. 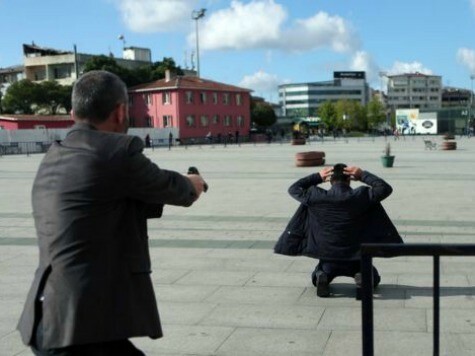 Following the incident, Hüseyin Kocabıyık, a legislator belonging to Erdogan’s Islamist Justice and Development Party (AKP), tweeted that the shooting was a “fake assassination scenario.” He added, “I’ve never seen or heard of such a fraud,” though he did not provide evidence for his theory that Dündar personally staged the shooting. Cumhuriyet is a center-left, anti-Islamist publication that has struggled to publish freely under Erdogan. In January 2015, the magazine was raided by police after announcing it would publish a Turkish-language inset version of the French satirical magazine Charlie Hebdo, following a jihadist shooting at its Paris headquarters that left much of its senior staff dead. Two journalists who used Charlie Hebdo cartoons to illustrate their articles were sentenced to two years in prison in May. Its editor-in-chief and senior Ankara editor were arrested in November 2015.